"a rigid dichotomy between science and mysticism"
A character project, finally! Or so I thought anyway, it was a weird first week. Designing characters is normally one of my favourite things to do, or at least it certainly was pre-uni. I suppose since then my interests have shifted more towards environmental work or maybe I'm just a bit put out by how this week as gone. Let me start by saying that this brief is open, and while I can see how some people would -and do- love this, I think I speak for the majority when I say that maybe it is too open. For starters there's no tri budget, texture budget or style restriction. This is the first project we've ever had of this nature (It's our second character project ever) and it's... intimidating- ps we need to design two characters. It's intimating and I think I had a bad reaction to that much freedom, I immediately went into panic mode and started to choose themes to help narrow it down, I started moodboarding for tribal and sci-fi, two totally different types of character. After our reviews, I realize how terrible of mistake this was, and I think it's because I misunderstood the purpose of the project, I was far more preoccupied with what I wanted to make rather than just silhouetting and having a unique character jump out at me. I was too threatened by the very short 3 week time period and I specialized too quickly into a design I didn't want. I don't exactly dislike this page of designs, I just feel embarrassed by my total misinterpretation of the brief. It's all about the designing process and I skipped over a huge part of it. I was advised (to put it lightly) to, effectively start again. I can see the logic to this now, but there was a raw spot after those presentations where the whole year was collectively seething, we felt cheated and tricked. While I'm completely aware of the mistakes I've made so far this project, there is something to be said about the brief itself for allowing us to collectively get it so wrong. Either way, time to reconsider.... everything, and get this thing back on track. 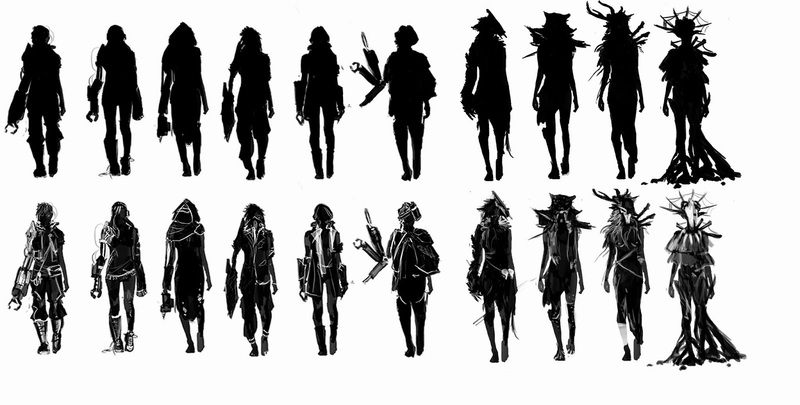 I'm going to make the effort to put more of my attention into shape and silhouette appeal, rather than detail.